How it began –Ben’s Jammin’ Art Project was established to remember Benjamin John Salvatore Cocco, a naturally creative twelve year old. His life here on earth was shortened by an accident. It is a goal of BJAP to nurture the creative passion that Ben had for art and music in the lives of others. About Benjamin – Like most young boys, Ben Cocco enjoyed the outdoors, camping, kayaking, riding his bike and lying in the snow. What made Ben different was his imagination and his need to create. Ben enhanced the lives of his friends, and family through his music, art, and humor. His life was an ongoing art project. Even as a toddler he would make amazing creations from whatever he could find – stones, bolts, boxes, and string were turned into space monsters, vehicles and weapons. He loved playing in the dirt, creating cities, adding his buildings and his little men, bringing them to life. As he grew older, he would spend hours reshaping and taking pictures of his clay men as he made his claymations. Ben was fascinated with the military and with guns. He drew a lot of guns. He would design guns, draw templates of them, trace them onto wood, and then he and his dad would cut them out. Ben would spray paint the shapes and add his accessories, -- hinges, latches, and old belts became sites, grips, and gizmos. And most of all Ben loved to draw. He could draw superheroes and supervillains from Star Wars and comic books as easily as he could create his own monsters and weapons. Ben discovered his love of music when introduced to the video game, Guitar Hero. It was the only video game he played. In the song choices, he discovered Metallica. Ben’s ear would instinctively pick out the drums. His fingers became his constant drum sticks. That wasn’t enough. Ben needed a drum set. 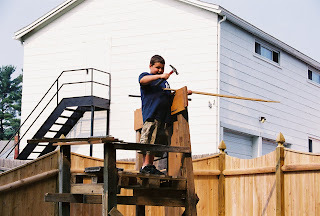 His parents couldn’t afford one at the time, so he made his own. Using an old, discarded, broken, and beat up electric drum kit, Ben duct taped Frisbees to the old pads, turned small dull saw blades into the cymbals, and used an old hat box as a snare drum. When he started to play, it was as if he played his whole life. He had rhythm! Ben played his drums and his brother Josh played air guitar with the Guitar Hero guitar every day after school. They would play through a whole Metallica cd. Ben could keep up with Lars, it was amazing. Ben never had a real drum set, and he never had art lessons to help him reach his full potential. It wasn’t in the” family budget’. Ben’s never having those opportunities is why Ben’s Jammin’ Art Project had to start. His older brother Josh did get a guitar, and we have seen how it has helped him with the loss of his brother; how it has given him a passion for life, for music. It keeps him grounded. Music is an essential part of who we are as people. The benefits of being able to play an instrument are priceless. This is why the youth of today need to have the option, the accessibility to be able to play music and to be able to be creative with art. Benjamin with some wood and imagination. 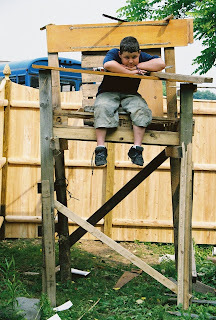 It may look like a over sized highchair to you, or a lifeguards post, but to Benjamin it was his look out tower. Our imagination is very powerful it is amazing what can happen when we use it. With Ben all this took was a pile of wood and some time and this is what he created, with a little help from dad. You can see he is shooting his gun on the front and there are two more in the back on the top. Of, course, as his mom after I told him how cool it was, I said" You do know you can't keep it there for long." Moms sigh. 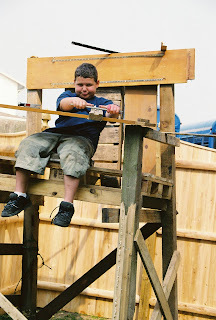 More pictures of Ben making and enjoying his lookout tower. 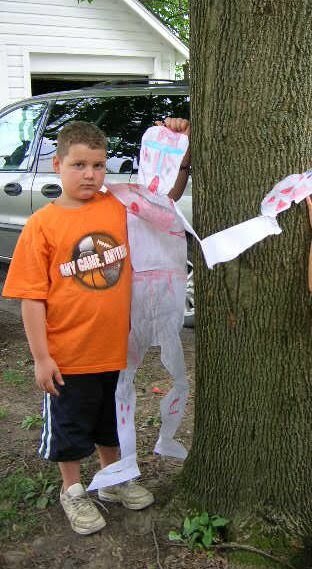 Benjamin was a naturally creative and passionate child. He always had us laughing. He was always doing something. 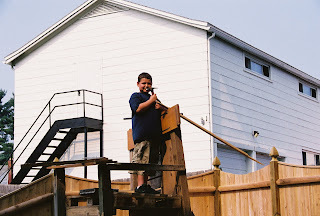 Here is a picture of Ben when he was about nine. He had some time, some paper, tape, crayons, and a love of Star Wars and he made his own life size storm trooper. Benjamin loved to draw!! One day about when he was about ten and a half, instead of picking up a pencil or a crayon to make a picture, he picked up the mouse. I could never figure out how to draw on the computer so I thought it would be interesting to see how his drawing would come out. I was impressed, without any help from anyone, he found the program on the computer and started drawing as if he was using a pencil and some markers. Above are some samples of the pictures he drew on the computer.